If you’re set on getting a cheap grill to spice up your outdoor cooking then getting a good gas grill might be the perfect option for you. So, we set ourselves a challenge to find the best gas grills under $300. At this price range, you’re going to be getting decent quality that can cook well. You won’t be getting lifetime products and there won’t be the same amount of features as some of the natural gas grills we’ve recently covered. 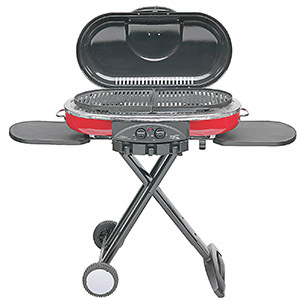 But you will generally get a good grill that can comfortably cook up some amazing food, easily and quickly. Some of the best grills under $300 are not only gas, we’ve looked at the best charcoal grills under $200 and have done a similar list for those. Charcoal has many benefits but so does gas. Use both of our articles to help you decide which is better: charcoal or gas. Ease of Use – Generally gas grills are the easiest type of grill to use. They usually start by simply turning a valve and pressing an ignition button. They also stop very easily, all you have to do is turn the gas off and the fire stops. Heat up Time – Gas grills have some of the quickest heat up times out of all the grills on the market. Some of the better gas grills can heat up within a few minutes. With a decent gas grill you can go from cooking outdoors on special occasions to being able to fire up the grills every night with ease. Versatility – With a gas grill you can comfortably grill all year round. A quality gas grill can easily be used as your primary outdoor oven as they will be able to cook comfortably whatever the weather. Even Heat – Cooking on a gas grill will give you one of the most even cooking areas of all grills. Temperature Control – Controlling the temperature on a gas grill is easier than any other grill. They usually have a good range of temperatures and switching between them is as easy as turning a knob on the front. They also have the ability to be able to easily set up different temperature zones. For example, having one burner on high to sear steaks whilst the other burners are much lower for thicker cuts of meat. You don’t get this kind of easy temperature control on any other grill. Ease of Cleaning – Most gas grills require a quick blast of heat after you’ve finished cooking and then a simple brush down to get them clean. There is also no ashes or soot to have to deal with. Gas Burns Very Clean – Propane is a very clean burning gas. This means that you will get a lot fewer soot deposits on your food and grill, compared to charcoal. Natural Gas is even cleaner than Propane. Taste of the Food – For the shorter cooks that you’ll generally be doing on your grill the gas flames will likely not make much difference. But if you plan on doing longer cooks or even try smoking on your grill then the gas flame can have an impact on the taste. This will likely not be noticeable to the everyday griller, but if you’re looking for the utmost quality in taste then this is something to consider. Maintenance – Whilst cleaning up is pretty simple for a gas grill there can be complications with the valves and tubes that allow it all to work. This can sometimes cause problems and can be costly. Looking after your grill appropriately will ensure that these problems are reduced. Propane Bottles – You will likely, at some point, have to deal with the inconvenience of running out of gas mid cook. You can buy a gas level meter to ensure this doesn’t happen and we recommend stocking up on a few bottles to make sure you never have to finish it inside. If you’re set on gas then you might also be interested in looking at our list of the best gas/propane smokers. A smoker will give you the ability to cook up some truly authentic barbecue and will almost certainly give you some of the best tasting food you’ve ever tried. 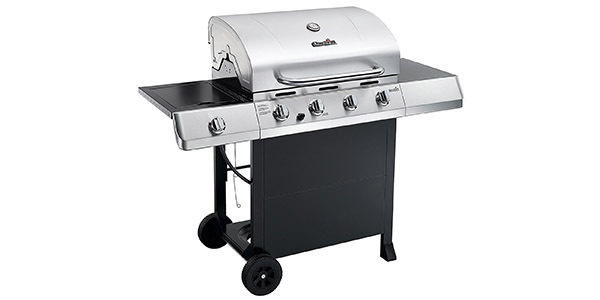 Char Broil have a large range of great budget gas grills. There are many that fall into the price range of $300 with the Char Broil Classic 4 Burner being the best of the best. This grill has a total of 5 burners, 4 main burners and a side burner. It has a total of 660 square inches of cooking space. 480 of this is on the main cooking area and the other 180 is the warming rack. This is more than enough for most smaller gatherings and will comfortably feed multiple people. However much you can find it for, this is almost certainly going to be right at the top end of the $300 budget but for that you get a lot of grill. The hood is made from stainless steel which helps to hold temperatures very well. The burners are also stainless steel and heat very evenly which makes cooking very enjoyable. There are a few plastic-y parts to the grill but overall the build quality is good. Durable porcelain coating on the cooking grates make them rust resistant and easy to clean. Overall, the Char Broil Classic 4 Burner Gas Grill is just about as good as you can get for a gas grill under $300. The built quality is mostly very good, despite the plastic wheels, back board and the side burner knob. These are the main areas people have problems but none of them concern the general usage of the grill. It’s packed with features and grills incredibly well with a number of design features that will make your grilling easier than ever. This is the best gas grill under $300 and is easily one of the best grills under $300. You won’t get much better for so little money. Not all gas grills have to be for the home. Coleman have created a fantastic little gas grill that can be carried around like a suitcase. It has many smart design features that make it one of the most portable grills available today. The thing you’ll notice is the collapsible stand with wheels. This acts as a solid stand and gives your grill some height so you’re not always grilling on the ground. But it also folds up into a very compact and easy to transport bundle that can set up in seconds. Not only this, but the Coleman has a set of sliding side tables that conveniently slide out of the way for compact storage. This is a really well designed grill that makes the problem of transport almost non existent. Overall, the Coleman Road Trip Gas Grill is one of the best portable grills on the market. It has some amazingly creative features that make it a joy to use. It produces great food and is simple to cook on, clean and transport. You can’t ask for much more from a portable grill. As the name suggests it’s perfect for a road trip but it would also make a perfect camping grill and works great as a tailgating grill. There’s not much we can fault it on and considering this is roughly a third of 300 dollar budget, we think this is a no brainer. Not only do Char Broil make the best grill on this list, but they also make the best 2 burner gas grill on the list. The Performance 300 gas grill is a small and compact grill that offers a surprising amount of cooking space and all the little extras you need to get cooking for family meals. It offers 300 square inches of primary cooking space using cast iron, porcelain coated grates. This is enough room for roughly 16 burgers. It also has a swing-away warming rack with another 100 sqaure inches of space. This can be used for more than just keeping food warm, and is ideal for toasting buns or cooking sides. Two stainless steel burners that are durable and offer long lasting performace. The Performance 300 is well built and feels solid. It doesn’t feel like a budget grill and looks great with a clean, stylish finish to the metals. It’s got a good cooking area and a nice range of features that make it easy to use and very good value for money. The only complaint we have is that the assembly can be a little time consuming and if not done perfectly a few of the parts might not fit properly. This is a very minor complaint and doesn’t take anything away from the grill. If you’re looking for a small patio grill then this is one of the best you can buy. Char-Griller have a large range of great products including one of the best kamado grills you can buy and their attempt at a 3 burner gas grill is good enough for it to make our list. 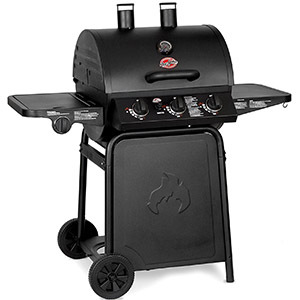 The 3001 Grillin’ Pro is a striking looking grill that offers a lot of cooking power. It has 3 main burners that have a total of 40,800 BTUs with an additional side burner that has 12,000 BTUs. This is a lot of power for such a cheap grill. It also offers 630 square inches of cooking space. 438 square inches of this is on the main grill above the 3 main burners and the remaining 192 square inches is found on the warming rack. The general construction and build quality of the grill is decent. It’s made from a heavy duty steel but doesn’t have the quality finish that makes the Char Broil Performance 300 so good. The 3001 Grillin’ Pro is a great choice if you’re looking for a powerful but compact grill for less than $300. In fact, with a little searching around you can easily find it for around $200. For this price, you’re getting a lot of grill. It has a few features missing that we’d like to have seen, for example a drip tray would have been nice. Also, the general build quality is better on other models but people have reported that their 3001 has lasted years. 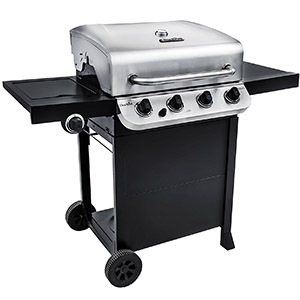 We’d recommend this to someone who is looking for a great budget grill that will be cooking up a lot of food and we think that this is the best 3 burner gas grill for the money. Another Char Broil grill makes the list. If there’s anything you can take from this list, it’s that Char Broil make some quality low budget grills. The Performance 475 is a 4 burner grill with an extra side burner that has a total of 46,000 BTUs. 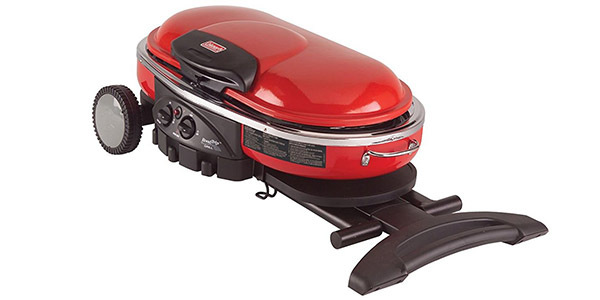 This makes it a very capable grill and gives you a lot of versatility to how you grill. Having 4 burners means you can set up different cooking zones easily. This is helped by the completely stainless steel burners and heat tents that create a very even cooking area and offer long lasting performance. The 4 burners are given a total of 650 square inches of cooking space, 475 of this is the main cooking area. This is enough for around 20 burgers, so this is perfect for larger gatherings. The other 175 square inches is for the warming rack which can act as a secondary cooking area. 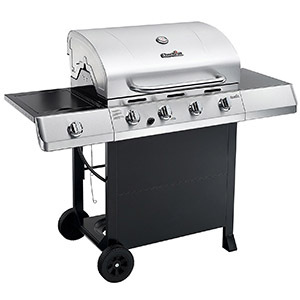 Like the other Char Broil grills, this is mainly stainless steel and is built very well. It also has a great finish and looks very stylish. 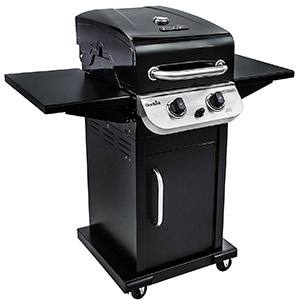 Overall, this is one of the best value grills you can buy. You get a lot of grilling space, a great quality build and all for much less than the $300 budget. We’d highly recommend this and think that it’s one of the best gas grills under 300 dollars. Make sure you season your grill properly. New grills are likely to come with oils and other manufacturer debris inside the grill. We’d recommend doing a “dry run” before cooking food. Turn all the burners up to the maximum temperature for at least half an hour to burn off any undesirables. Check your grills manual or our seasoning guide for more information. We’d high recommend picking up a cover for your new grill. This will drastically prolong the life of the grill, and as these grills are on the lower end of the value scale a cover will be worth so much more. Here’s a selection of Char Broil covers. Stock up on propane. You’ll regret not doing this if you run out half way through a cook. Luckily Amazon sell everything now-a-days and they even sell propane tanks at very reasonable prices. Check the latest prices here. Use a good digital thermometer to make sure your food is done to perfection. If you’re looking for the right temperatures, then check out times and temps charts. We hope this has been helpful and you now have a better idea of which gas grill under $300 will be perfect for you. If you have any questions then please ask in the comments and we’ll get back to you.